We all braved the horrendous Nebraska weather Thursday night and held club. I'm so glad we all made it home OK!! Next time though, I will reschedule!!! Here are two of the cards we did. I will post the 3rd item later as it's going to need some explanation! First, we did this Criss Cross Card. Find a Tutorial HERE on Splitcoast by the wonderfully talented Beate Johns. I'm so glad she does all those wonderful tutorials-makes my life SOOO much easier!! 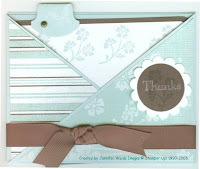 We used the Afternoon Tea DP from the current Occasions Mini catalog (still available!!!). The "flaps" are covered with reverse sides of a sheet of the paper. Colors are Soft Sky and Chocolate chip. The card base is Soft Sky. The insert is Chocolate Chip with Whisper White. We stamped Sky flowers across and added a Sky tab. The brad is only for accent! We punched a Whisper White scallop and layered on a Chocolate Chip circle, stamped with the same flower in Chocolate Chip with "Thanks" stamped across it in Craft Whisper White ink. We tied a Chocolate Chip wide grosgrain ribbon around it all. The stamp set used is the Live Your Dream set from the Mini. The paper coordinates with that! Our last card of the evening, one we probably should have skipped and headed home instead! But, we didn't. The card base is Blue Bayou. The DP we used for this one is from the Western Sky set. The card base is a striped one, and the star is covered with another that has a star print on it. The star is chipboard, BTW, as are the hearts. For the hearts, since we don't have In Color Craft pads, we took a dauber and colored the star with Blue Bayou ink. We then covered the entire heart with Versamark and embossed with Irridescent Ice EP. They do sparkle IRL! We tied a Soft Sky ribbon around, and layered all together. The "Wonderful" and "father" are from the Wonderful Favorites set and are stamped on the DP with Blue Bayou. Lots of possibilities with that set! Remember these "In Colors" are going away with this catalog. If you don't have sufficient supply of them, call me today!!! Many of the Designer Papers will change too as they have those colors in them. Off to pick up a boy at the pool, and see about getting some landscape shrubs replaced that didn't make it through the winter. Later! Glad that you're safe, you silly stamper! Great cards, btw!